Welcome to the central website of Kenneth M. Price, Jr. This is the quickest way to connect with his research, writings and discoveries via links to books, videos and podcasts produced during the past 12 years. The main focus of his writings is an expose of American's undeserved dependence on petroleum products that are supplied by a monopoly. Even worse, this monopoly is a corporate conglomerate that includes the automotive industry. In fact they control the truck, airplane, train and shipping industries as each are petroleum-consuming infrastructures that the industry relies upon to keep their volumes of crude oil flowing. This same monopoly controls the tire, battery and brakes industries, and this is just to name a few. And it reaches worldwide. In fact all of the transportation mechanisms you see in operation today have been nuanced into operation by Big Oily. In the meantime we have forgotten that no nation should ever be dependent on items that are supplied by a monopoly. Searching for an answer to this paradox led to Price doing additional research regarding secret societies that have been involved behind the scenes in just about every major historical event. This led to research regarding the actual sinking of the Titanic. This led to researching the true cause of the burning of the Hindenburg. As you might have guessed by now, the two are very much related. With regard to the Titanic, new evidence is presented that shows she was professionally demolished. The evidence comes from the wreckage and consists of two separate pieces of Titanic's outer hull, where just beneath her engines, two 30' sections of double-plated bilge are completely removed. If these two pieces, as documented by the History and National Geographic Channels in 2015, are in fact real, then the cause and manner of the Titanic sinking needs to be completely rewritten. In the case of the Hindenburg, a recent disclosure of a confession by a known secret society member provides the first actual cause of her burning that is believable. Now that you are wondering what the Titanic sinking could have to do with the petroleum monopoly, hang on to your seats! It will be shown how the Titanic was deliberately demolished in order to help steer the 20th Century public into an airline industry that was 100 times more dangerous. And in the case of the Hindenburg, we were denied anti-gravity technology and hydrogen energy. What could be the reason? Steamships running on coal could cross oceans for pennies compared to aircraft running on high octane, expensive refined aviation fuel. And later, airships running on diesel fuel could cross oceans for 1/10th the cost of the piston powered fixed wing aircraft. The facts reveal that the steam engine was an ingenious mechanism and most of them built could have lasted for a century! So, what is going on here? Let's look at some facts: The Titanic used 600 tons of coal per day. Today's cruise ship uses only 250 tons per day. So what! Coal prices in 1912 were $1.00 per ton; while today's processed fuel is $600 per ton! It took the Titanic roughly 5 days to cross resulting in 3,000 tons consumed, or roughly one ton per person, or roughly 1 dollar per person. Today, the QE2 has reciprocating diesel engines that consume 430 tons of marine fuel oil per day. Here's the only real pertinent fact: Fuel oil is a total rip-off compared to coal. $600 per ton x 430 tons = $258,000 in fuel costs per day! Admittedly, the QE2 takes a little less than 4 days to cross. 4 x $258,000 divided by appx. 2,000 passengers = $516.00 per passenger in fuel oil. And by the way, today a ticket on the QE2 cost $1,590 per day whether you are an infant or an adult. We've been had. Big oil wanted to phase out coal. Read on to see the two separate pieces that were somehow completely removed from Titanic's bottom that forever destroy the current misconception that she sank from striking an iceberg. And if the Titanic was demolished deliberately, then the reason for her demolition needs to be brought to light. This is where the Hindenburg enters the picture to help solve the puzzle. ​For an overview of the Titanic and Hindenburg stories check out this 4:00 minute video. This will lead you to the YouTube Channel of Kenneth M. Price Jr. where additional videos are available. In this two hour discussion the destruction of the Titanic and Hindenburg are for the first time discussed on air together and in a new light. As the true potential of them is properly accessed, a discussion follows about how the two events impacted the best transatlantic-crossing mechanisms ever conceived. Thus, the destruction of the Titanic and Hindenburg altered the future of all transportation mechanisms worldwide. Kenneth M. Price, Jr has written extensively on the subject of Big Oily and their control of the world's energy and transportation mechanisms. He has produced Book 1 and Book 2 on the subject. In addition he has written on the subjects of cooking and music and offers a book on each. All of Kenneth's writings are copyrighted with the U.S. Library of Congress and are published on-line for free. Most will discard these books as being too cheap to be any good, and this is exactly why we chose this method. Those who proceed from here are considered to be part of the smartest audience on the web. 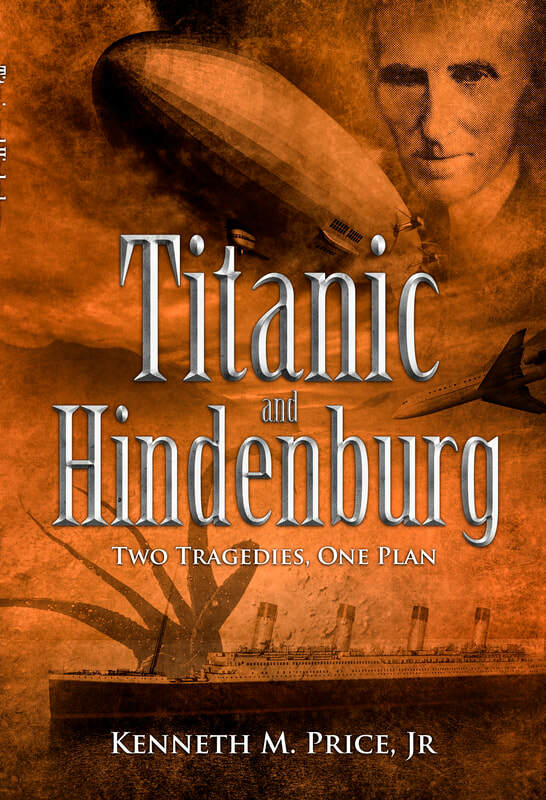 ​​​​ Titanic and Hindenburg, Two Tragedies, One Plan is an extensive piece of research and discussion that finally sets the record straight with regard to what actually caused the Titanic to sink. Ever since 1985 when the Robert Ballard Expedition discovered the wreck of the Titanic on the bottom off Newfoundland, and that it was in two fully-separated pieces, Kenneth has been wondering how these pieces of this steel ship became fully detached from the hull and each other. Since ice does not cut steel, nor does steel normally separate, the fact that there are totally-separate pieces spells "coverup" of the real cause. Later in 2008, after reading the book by Brad Matsen entitled Titanic's Last Secrets, ​Price had seen enough to bring in his own intensive research. He knew that when steel is put under too much stress it becomes stretched, bent, buckled, twisted, crushed, etc. but not separated as in torn, broken, sheared, shattered, etc. So, what caused the total separation of pieces from the bottom of Titanic's 1" thick double plated hull? In the process, Price searched for every possible motive he could find and began to see how steamships in general had been targeted. Why would steamships have been targeted, and by whom if they were, he wondered? Further research led him to discover how fuel-efficient these turn-of-the-century steamships were, especially compared to the marine propulsion systems in use today. When Price looked at the trends in air transportation development he immediately found a connection with the Hindenburg, as he soon discovered that she was the most fuel efficient flying machine of all time. And this is how petroleum consumption and fuel efficiency became the connecting link between the Titanic and the Hindenburg. As a result of this newly found evidence combined with his knowledge of transportation mechanisms from the present as well as the past, a more realistic picture of what really happened to these two ships has emerged. What were the true motives? Were they specifically carried out to dramatically change the course of our transportation industry? Titanic and Hindenburg; Two Tragedies, One Plan finally tells the whole story and in the process smashes the many misconceptions the public still harbor to this day regarding these gigantic passenger carriers. 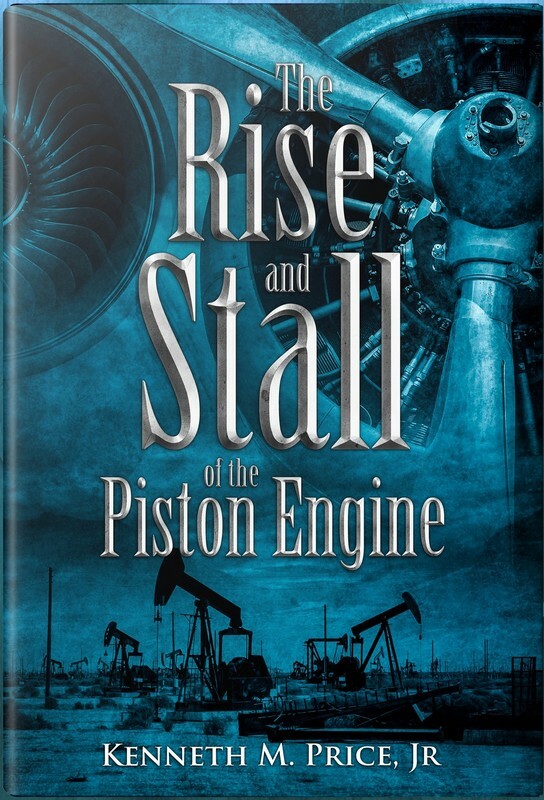 The Rise and Stall of the Piston Engine is a must read for anyone wanting to stay abreast of "modernized" technology and transportation mechanisms. It is both a ground-breaking expose of the Oil/Auto industry as well as a precursor to the story of the Titanic and Hindenburg; Two Tragedies, One Plan. Learn that the beloved gasoline-powered piston engine design was never anything more than a means to help consume as much fuel as our nation's petroleum-powered infrastructure could provide. See all the hundreds of better engine designs and fuel types that have deliberately been covered up. Realize that all too often, these coverups occurred at the expense of the life of the inventors. ​ The experience needed to write this book came during 1976 through 1990 when Ken worked for a major oil company as a lubrication specialist in various locations including Texas, the Northwest, Alaska and California. His job was to inspect and report on gas-driven engines, turbines, dams, pumps, earth-moving equipment, compressors, rolling machines, factory presses, machine tools and a whole host of other industries that the average person never sees. These were expensive pieces of equipment and each had a special lubrication requirement. It was a great way for Ken to become familiar with a vast amount of equipment and machinery. During that time Ken came to the realization that not all was well within the industry as from its inception it was based on clever marketing practices rather than bonafide scientific research. He couldn't help but notice that many inefficient and environmentally toxic petroleum-powered devices and transportation mechanisms had been artificially promoted. This was especially apparent in the automotive, aircraft and marine industries. Here, Ken also found that the mechanisms from the past were every bit as good if not better than the similar mechanisms we are building 50 to 100 years later. Most people were never aware of the nefarious forces in the industry that helped create the illusion that our petroleum powered mechanisms were improving over the years. The Rise and Stall of the Piston Engine helps fill in the details. So here it is for free, unmolested. Once we are set free from the false future of petroleum, we can carry on with an optimistic view of the future. ​Here's a sample video of topics from the book. This useful, down to earth book is for anyone who is interested in taking a positive step toward providing better nutrition for the people they cook for. Switching to pure Sea Salt can dramatically improve anyone's cooking, and the book provides a way to obtain it at a low price. In today's GMO/pesticide-laden world the reduction of such toxins that are in our foods and spices is of increased importance. Switching to pure Sea Salt helps to reduce these toxins and thus supports improved health. If you need to cook meals for yourself, then here are plenty of simple recipes that will knock your socks off. Wheatie's Sea Salt Cookbook is written in a manner that appeals particularly to young men and women, who starting out on their own, often shun the idea of cooking. In particular, it enforces the importance and benefits from the use of natural foods such as onions, garlic and peppers. It contains 148 "killer" recipes that are simple and tasty. The entire contents of Wheatie's Sea Salt Cookbook is available at this website. It contains all the good recipes taken from all of my cooking experiences. It also contains techniques, such as egg-flipping and countless seasoning "secrets" that will add tremendously to your cooking abilities. The material is easy to read with a perspective from someone who's both been in the restaurant business and applied the latest information about harmful ingredients, such as table salt, to the subject of preparing healthy meals. In addition, the book contains a section on distillation of fermented mixes and shows how to build a functional still for around $100.00. See the section toward the very end of the book. A parts diagram is included. Ken has always been on a personal quest for good health. Making your own alcohol is another way to save yourself of a myriad of toxic chemicals that are put there deliberately to degrade out health. Here's a fun collection of songs created by a father of two boys who took them and his wife to Fiji to live a simplified life style. From 2002 through 2006 Wheatie and his family lived on a boat anchored out from a nearby village. It was during this time that Ken (Wheatie) got totally free from worrying about money, paying bills and getting to work on time. As it turned out, the peace and slowed pace of life allowed him to connect with the Fijian people and to treat each day as if he always had another to finish his endeavor. No rush jobs. Do a job you don't like? There was time to make it right. And thanks to good fortune, this way of life went on for nearly five years. ​ It was a time of great reflection on his past and for a renewed appreciation of his family and the life that he had lived. These sincere thoughts combined with his paradisaical setting led to the creation of this music and the writing of Wheatie's Songs of Fiji for Trumpet and Guitar. It contains 19 unique high-spirited songs, prepared on sheet music for either brass or guitar instruments to play.